This fall, Riverbend High School’s theater department put on Ken Ludwig’s Leading Ladies, a comedy play that debuted in Texas in 2004. Ludwig is a two-time winner of the Laurence Olivier Award, a prestigious award in the theater community. He is also the author of Lend Me A Tenor and Moon Over Buffalo. This is the third play the Theater Department has performed that was written by Ken Ludwig. Leading Ladies showed at Riverbend from November 8-11 and November 15-18, costing the viewer $7 for each performance. Over the course of eight shows, the theater department sold __ tickets. This money will go to other shows the Drama Department will produce this 2017-2018 school year as well as towards the Lundstrom Scholarship. This scholarship was named after Corporal Brett Lundstrom, USMC, student and godchild of Mrs. Cresswell, who died serving in Iraq 13 years ago. The money is awarded to the three Riverbend theater students with the most volunteer hours this year. The majority of the play is set in the living room of the Snider home. “Mrs. Cresswell played a huge role in the design and creation of the sets,” Stage Manager Sophie Thomas said. The set was built by Mrs. Cresswell, the Technical Theater class, and other drama students. Senior Alexis Dobynes designed the posters to get the word out, as well as the train station set seen in Act I, Scene III. Leading Ladies is set in the Amish county of York, Pennsylvania in 1958. The main characters are failing English Shakespearean actors, Leo Clark and Jack Gable. (Leo was played by Ty Gorham, Kyle Miller, and Mikey Przepiora, while Jack was played by Hunter Sherry.) Leo and Jack read an article in a newspaper that says an older woman, Florence Snider, is unable to find her sister’s children, Maxine and Stephanie, who go by Max and Steve respectively. They are the heirs to her multi-million dollar inheritance and left Pennsylvania for England when they were six and four. The two main characters then decide to dress up as the girls in order to claim the “prize.” While the boys are dressed up as women, Leo falls for Florence’s niece Meg (played by Katie Clark, Maddy Elliot, Karli McGuire, and Izzy Petretich), who is engaged to be married to Duncan (played by Alexis Dobynes and Maddie Marshall), and Jack falls for Florence’s (played by Alexis Dobynes and Maria Rueda) friend Audrey (played by Tori Dilts, Ashley Smithson, Brooke Talbott, and Ashley Kipper), who is engaged to Butch (played by Olivia Dilts and Natalie Williams), who is the son of Doc (played by John Bozarth and Tiffany Nguyen). Later on, things begin to get more complicated, as if they weren’t already. Actor Leo Clark comes to town because he, dressed as Maxine, tells Meg all about himself, wanting her to fall for him instead of marrying Duncan. Meg has been in love with the theater forever and is so happy to learn that her new cousin Max knows her idol, Leo Clark. Jack, being jealous, takes off his Stephanie disguise and joins as the family puts on their rendition of Shakespeare’s Twelfth Night on the day before Meg and Duncan’s wedding. As they teach the others how to be actors, Leo and Jack are able to get closer to Meg and Audrey as themselves after they talked themselves up through Max and Steve. The real Max and Steve show up on Florence’s doorstep even though Leo and Jack have been dressed as the girls for four weeks. Duncan feels extreme joy because he suspected something fishy about “Max” and “Steve” all along. The real girls end up getting arrested since the police believed that they were the two con artists. In attempt to break up Meg and Duncan, Doc receives a letter meant for Duncan, saying Stephanie loves him. This puts the chaos of the last scene into motion. After the police leave, Leo and Meg both confess their undying love for each other, as do Jack and Audrey. Meg and Audrey both call off their prior engagements because of their new loves. Butch and Doc continue to fight over Stephanie which resulted in John Bozarth and Hunter Sherry sharing a real kiss on stage for the first time during the November 17th showing of the play. 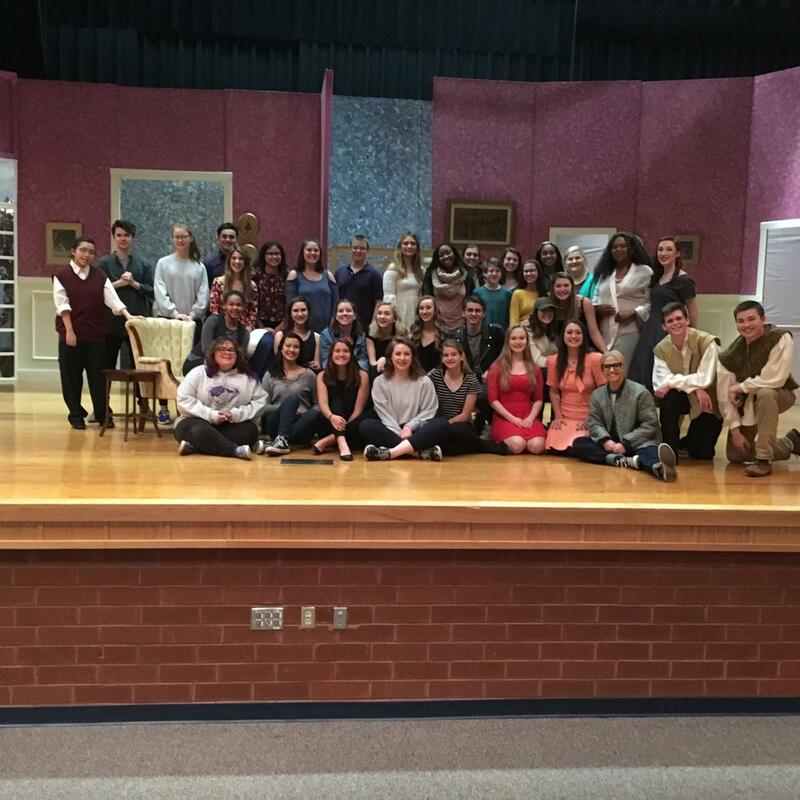 Riverbend’s Drama department’s performance of Ken Ludwig’s Leading Ladies was a play anyone could enjoy. The plotline could get confusing at times but the humor made up for some of that. Senior Karli McGuire, who played Meg for three of the eight nights, said, “The crowd was laughing a lot. They really seemed to enjoy the show!” If you missed this show, don’t worry, The Drama department will perform another show in the near future. Go Bears!